Carlos Javier Munoz was born March 12th 1981 in Torrance, California. The six one right hander attended Long Beach University getting drafted by the New York Mets in the 13th round in 2003. 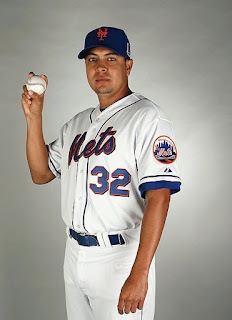 After pitching four years in the minors & in the Mexican League as a reliever, he got his break in 2007. 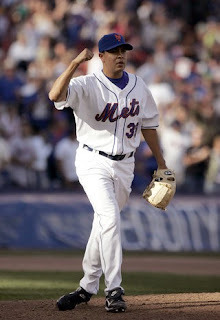 Muniz would get called up in late September debuting in a 10-9 loss to the Washington Nats during the Mets 2007 collapse. He helped finish out the combined one hitter with John Maine pitching a hitless 9th inning. In 2008 he had a decent Spring Training & made it North with the club. He made three April appearances finishing off games with no decisions. He would be up & down to the minors a few times during the year. On May 29th he got credit for a hold in an 8-4 win over the Los Angeles Dodgers. On July 2nd, he served up a walk off HR to Troy Glaus in St. Louis as the Cards beat the Mets 8-7. A week later he earned his only career win, it came in a 3-0 Mets shut out of the Colardo Rockies at Shea Stadium. He pitched the 5th & 6th innings, relieving Pedro Martinez. He made 18 appearances for the 2008 Mets posting a 5.40 ERA going 1-1 with 16 strike outs & seven walks in 23 innings of work. The next year he went 0-3 at AAA Buffalo in just 12 games. He spent 2010 at A ball St. Lucie & Binghamton but there posted an 8.38 ERA. He pitched in the Mexican league in 2011 ending his career there.